The way you choose to wash your face and skin can significantly impact your appearance. Many soaps and detergents leave your face feeling tight which we perceive as being clean. Unfortunately, this tight feeling is a sign of mild skin damage. In this section, we will look at which type of cleansers that are recommended along with ones to avoid and the reasoning behind it so you can make the best decision possible for happy healthy skin. That tight clean feeling may be the result of an astringent or an alcohol base which removes a lot of makeup or debris but wreaks havoc on your skin. The alcohol significantly damages the top layers of your skin and alters the natural barrier function as well as causes irritation. Take home point: avoid alcohols in your skin care products, cleansers, and cosmetics! Most regular soaps are not favorable because of their pH and composition. Soaps are made from saponification where a strong base (alkali) is mixed with a fatty acid. The resulting soap product has a pH that is usually around 9 and produces a lot of lather or suds. Common soaps that have a high pH include Dial, Lever 2000, Irish Spring and Ivory. These suds do a wonderful job of capturing and removing dirt but again remove the natural lipid barrier that protects you from the environment. The elevated skin pH along with the barrier disruption can alter the skin flora and further dry out your skin predisposing you to a more issues such as scaling, itch, acne, dermatitis and possibly infection. So what cleanser should I use? Limit washing to twice a day. Frequent washing does not make your skin cleaner! This will only cause more rubbing, irritation and skin barrier dysfunction leading to more problems. Wash your face more if you are very active to the point of sweating, see below. 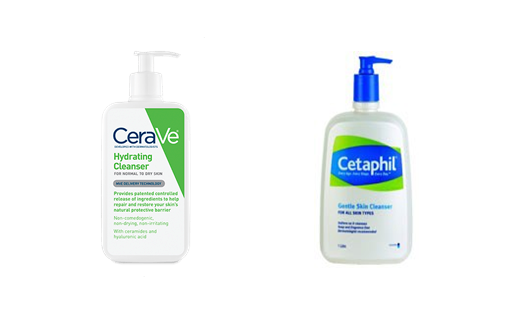 Use a gentle cleanser such as Dove Sensitive Skin Unscented Beauty Bar, Cetaphil Gentle Cleansing Bar, Aveeno Moisturizing Bar, Aquanil Cleanser (Aquanil Cleansing Lotion), CeraVe Hydrating Cleanser or Cetaphil Gentle Skin Cleanser. Read more in our facial washing 101 post. Wet your face with lukewarm water (not hot) to avoid drying out your skin. Use your fingertips to apply the cleanser. Using a loofah, washcloth, sponge, or anything harsh can lead to irritated skin. Do not to forcefully rub or scrub your skinwhich causes more irritation. Rinse the cleanser off within 3 to 5 minutes with lukewarm water. Ensure all of the cleanser is removed. Any residue can lead to dermatitis. Pat dry with a soft towel. Avoid rubbing dry. Apply moisturizer if your skin is dry or itchy. Lock in the water and natural moisture. One of the best times to moisturize is right after washing. Wash after sweating heavily. Perspiration, especially when wearing a hat or helmet, irritates the skin. Wash your skin as soon as possible after sweating. If you have questions or concerns about your skin, you should make an appointment to discuss your individualized skin care needs and concerns. By following these simple tips, you can say goodbye to harsh soapy skin suds, maximize your cleansing regimen, and say hello to happy healthy skin! American Academy of Dermatology. Accessed at https://rosacea-support.org/aad-how-to-wash-your-face.html.